When my wife and I decided to sell our home earlier this year it was not a long, drawn out process (Selling a home by owner). We had a rare opportunity to avoid the trap of buying and selling a home at the same time. My grandparent’s 100 year old home had been rented for the past 10 years, but when the tenant moved out in December it sat vacant. A 100 year old house, without proper maintenance and a little TLC will not make it too long. We decided we could move into this house, show it some love and free ourselves from the chains of a mortgage so we could make the right decision on our next home purchase. Although I have never undergone the buying and selling process simultaneously, I can imagine it is harrowing. Therefore if you have the opportunity to sell, move into another place and then deliberate your next move I would absolutely recommend doing such. Now that we had lined up a place to stay upon selling our home we were ready to do the dirty work. We entertained the notion of hiring a realtor, but the economics of it simply didn’t work out for me. Over the course of 5 years we had built up about $5,000 in equity. If we sold the house for $100,000 (less than we gave) after the 6% commission we would owe the realtor $6,000 then after paying our portion of taxes and closing costs we would need to bring $1,500 to the closing. Even if it meant spending a bit of money upfront it was worth it to me. The way we looked at it was “we’re paying ourselves 6% to sell our house”. Given the stakes involved it seems a little bit strange how few people sell a house on their own. I know people that drive 5 miles to save a dime on a gallon of gasoline, but they list their house with a realtor, immediately forgoing 6% of their most valuable asset. We had never sold a house before, but how hard could it be? The first thing we did was repaint the vibrant colored rooms a neutral tan. This is not exactly a trade secret, but it is astonishing to see the number of sellers that neglect this important detail. We then began to move out any unnecessary clutter in the house. We had the option to go ahead and move it to our new home, which was convenient. Even if this is not an option for you then rent a storage unit. We moved quite a bit of furniture including our loveseat (leaving only a couch, but making the room look much bigger). We moved out the computer desk, printer and other items that looked out of place. After minimizing the clutter we moved around our furniture for pictures. The home should look picturesque, not lived-in. If moving furniture from your house permanently is too much of a burden at least move the excess out of the room for pictures. 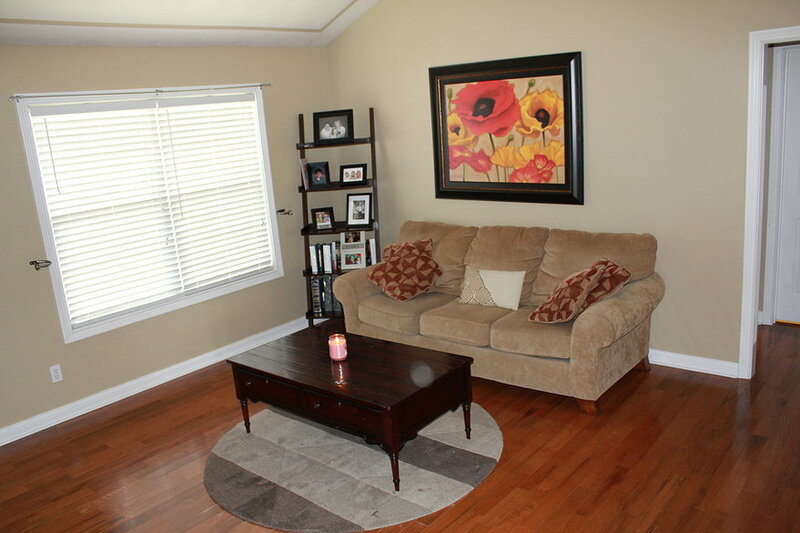 If you have wall to wall furniture in a room it will look even more cluttered in pictures. After arranging the room the way you like and cleaning it thoroughly, take your photos. DO NOT use an old Nokia camera phone or a polaroid. We used our Canon t2i digital SLR, but there are plenty of point and shoots that offer quality photos. Memory is cheap, so take hundreds of photos from every angle the photos are what will sell your house. Hopefully you have taken photos over the course of living in the house and stored them somewhere you can find them. For instance, when we were starting to list the house there were only dreary days and the grass had not greened up. I had photos of the exterior of the house from the previous year after all the flowers had bloomed and the grass had pretty stripes. Although I would contend that pictures sell the house, they are absolutely useless if nobody sees them. So now is the easy part, we will just list them online and wait for the calls. Unfortunately this is where we hit a bump in the road as “For Sale By Owners”. With the exception of Zillow, the majority of the big home sites did not allow FSBOs to list their own homes. We put our home up on craigslist, Zillow and got people to share it on Facebook (don’t laugh). I even made a website that included all of our pictures, descriptions, maps to the house and everything. After a few days of these marketing tactics my dear wifey was ready to give up her career as a realtor. She recommended that we hire a realtor to sell the home for us. I could not stomache the thought of parting with a minimum of $6,000 to do work that we could do. We had already taken better photos than most realtors, we had already done their job for them. I told her to give it a few more days while I walked the information superhighway in an attempt to circumvent the listing services. Finally after much searching and deliberation I solved our problem. Yes, it turns out the best way to gain maximum exposure in marketing your home is to use a realtor. Then the realtor loads your home on the MLS and then that data feeds all of the other pertinent websites. It seems really unfair that I can do most of the work and I have to pay the guy 6%, so I found another way. I Googled “MLS Flat Fee Listing Kentucky” and found http://www.getonmlscheap.com . Chuck is a realtor in Kentucky that charges $199 and he will load your pictures, descriptions and important data onto the MLS. If a buyer’s agent sells the house then you pay them an agreed upon commission (in our case we offered 3%), but the most the listing agent makes is the Flat Fee. So even if the house sold through an agent we would only pay $3,200 in fees (per $100,000 sales price). The regulations are much more strict when working with an agent even in this capacity. By law we were no longer to say “For Sale By Owner”, even though we were doing all the work. To make matters worse, we did not know that there are multiple MLS for each area. All of the agents in my city use a local MLS, but my home was placed on the regional MLS, making it less useful. However, we were listed on all major websites and even with hindsight I would probably do the same thing again. My wife spent the next day emailing and calling every realtor in our town to let them know that our home was on the market. In fact, we got a showing the very first day, within minutes of posting on the MLS. The realtors told us our home was beautiful and it “showed very well”, but we did not get an offer that day. A few days passed and nobody called. My wife continued to notify realtors in the area, update Craigslist and Facebook. Then we randomly got two calls in one day. A realtor called and scheduled a showing for Sunday and an unrepresented buyer saw our pictures on Facebook and asked to see our home that day (Friday). My wife cleaned the house all day and had it looking flawless for our second showing. The woman and her family looked through the house and she seemed to light up. She was definitely an interested buyer! We showed her around the place, left her alone and she continued asking questions. She asked if she could come back later that same night at around 10 and we told her that would be fine. It was at this point that she made us an offer that came in a little low, but we countered with an offer that met in the middle, but allowed us to keep our kitchen appliances. She said she already had kitchen appliances anyway, so it was a fair deal for all. The best part about selling without paying commissions is that you actually get the vast majority of the selling price. If I had sold my house for $100,000 without a realtor, I would need to sell it for $106,000 with an agent and at 6% commission on 106k I would actually only make $99,640. Including the Flat Fee MLS listing of $200, the $50 lawyer fee and the $400 tax bill we only paid $650 to sell our house.